Ron and Kate DeMers added Simmental cattle to their business in 1983. We started with Angus cattle in 2002. 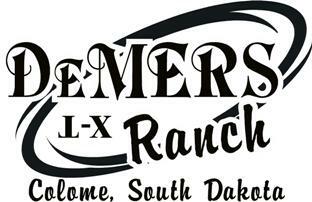 Today, the ranch is owned and managed by the Ron, and Ross DeMers families. All the Simmental bulls are black and are all polled. The Angus cows came from some of the top herds in the country. All of the Angus cows are AI and then cleaned up with Simmental bulls to get ½ bloods. The genetics and weaning weights are some of the best available. The ranch is located 5 miles West, 2 miles North, and 1/2 miles East of Colome, South Dakota. Stop in or give us a call for more information.